So, it's the end of May. And how is my list of 40 things to do in my 40th year going? But, as predicted, I am merrily chomping through my goal of reading at least 12 books. I thought I would share some highlights of them so far. 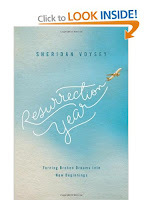 Firstly - I have just finished reading a sneak preview of Sheridan Voysey's book, Resurrection Year - due out in a week. 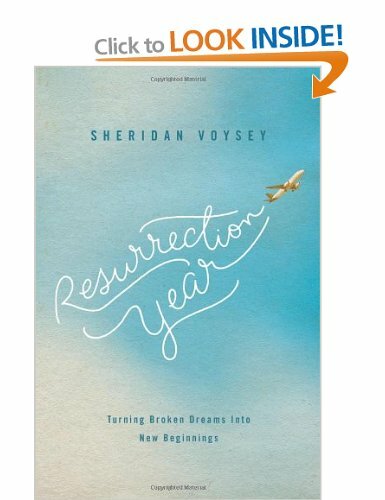 Thank God for Sheridan and his wife Merryn - daring to share not only their story of struggle, perseverance, strength and hope, but for sharing their interior world, their spiritual journey and their love of travel and life in the midst of it. Whatever your own particular challenge, whether is be childlessness, or disability, or redundancy, or whatever - just walking with them, in such a beautifully written and thought-provoking book, will encourage your socks off. Honestly - when it launches in a week - just go and buy it, or pre-order it now. Sheridan is a phenomenal broadcaster and writer, Merryn a brilliant mind working at Oxford, and we are blessed that they have fairly recently moved from Australia and made the UK home - I really look forward to seeing and hearing much more of him and his ministry. 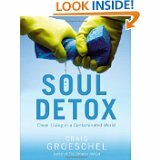 Secondly, Soul Detox by Craig Groeschel was a tonic. I love this guy - so full of faith and life - and so blunt! Love it! I also like the picture of the vulture and the hummingbird. These 2 birds both find what they are looking for. One looks for decay and death, and one looks for sweet nectar and life. The same is true for us - we find what we look for too - whether we look for negatives in people and life - we will find that easily enough, or whether we look for the positive - and guess what - we can easily find that if we decide to focus ourselves too. 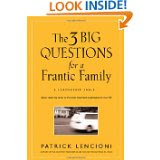 And finally, Patrick Lencioni and his 3 big questions for a frantic family. I have heard Patrick speak in his leadership capacity - he is exciting, fun and focused. So I was interested in this book - transferring, essentially, some business strategy into our families to make them more effective. But, most unusually, it is written as a narrative or fable. 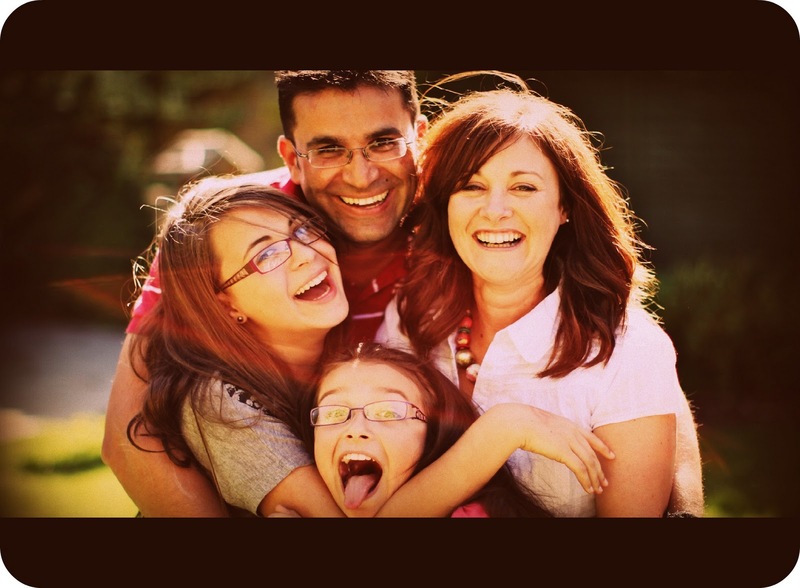 This has some strengths and weaknesses when you get to the nitty gritty bits, and I am not sure we could ever create the family plc he describes - but it was very very helpful for me. I thought more deeply about what are our values - which should inform our actions, our giving, our time, our priorities. What are the things we should be prioritising in these next 6 months. How are we making sure we are doing what we really think is important - or do we never think about what is unique or important about our family and to us? Excellent tool for engaging with our family in a different way, and perhaps one that both men and women would find accessible. Will this be the one of the only part of my 40 things list I will accomplish!?!?!? I don't think I am a particularly hysterical or emotional person, but this still feels like a significant milestone. Like I should know myself and what to do with my life for example. All the normal stuff, you know, am I making a difference, am I spending my influence wisely, are my priorities straight, is my time being well spent, am I developing in the right direction (the waistline certainly is not)? As usual I wrote a list (I know, it's an addiction - especially since discovering Wunderlist) of all the things I hope to achieve this year, and the projects I am involved in, the goals I need to achieve for the house, for church, my work projects, and I saw that I have a busy, interesting and, as usual, massively underpaid year ahead! I also wrote my 6X6 (thankyou Bill Hybels) - which are my six priorities for the next six weeks (or half term more realistically). But I don't want this year to pass in a whirlwind of work, volunteering, teenage diaries and chaos without feeling I had done something special. However, I don't have the funds for a trip to New York or Prague, and I really am not interested in climbing a mountain or cycling across the country. So I decided to make the year more interesting, by including 40 different things. Some easy, some a bit more challenging, some free, some which might be a bit more financially dependent, some which will seem ridiculous to others who can easily do these things, but are significant to me. And here they are. I want you to know, so you can check up on me to make sure I am making time in my life for them! And I will be writing each month to let you know how it's going - that's one of the #40things anyway! 35. Read 2 classic books, 2 Autobiographies, 2 faith-focused books, 2 self development books and 2 fiction books. I must thank all the people on facebook and twitter who helped with suggestions and encouragement. I have, at almost 40 got the most incredible bunch of friends. I am very grateful for them all. So here is to a fun-filled, fruitful and fulfilling fortieth year! This week while dropping the children at the school gates in the morning, I suggested a shortcut across the field in the afternoon. This back exit would save considerable time while walking home. I agine my surprise when I was informed that no cool people use the gate by the field. Okaaaaaaayyyy? I asked for clarification. Apparently geeks who hang out near the library would be the ONLY people to use that gate. All the interesting people us the front gates. Gosh, I don't miss being a teenager. All those unwritten rules which are subtly communicating to the world your place amongst your peers. Your bag, your friends, your hair, your phone, and where you hang out. And who decides this stuff!? And the funny thing is we all remember feeling on the edge of acceptance no matter who we are! I admit I largely remember hiding in the music block at school. I was a long long long way away from cool! But, on reflection, as adults we still construct all kinds of subtle codes which communicate about ourselves, our status, our significance and our place in the world. We use all kinds of symbols, labels, places to hang out, and other codes to express ourselves - sometimes consciously, sometimes not. Sadly, It is sometimes tempting to try and communicate an enhanced version of ourselves, the glossy best bits, in the hope, just like a teenager, that We will find our place in the playground of life. Fortunately friends and family are the antidote to this temptation, and it is when we are most accepted that we communicate our true selves - warts and all. So, while I yearn for my teenage girls to rise above the pressures and conventions of school culture, I also accept that our more sophisticated adult versions are just as prevalent, and no less exasperating when you think about it. I'll keep travelling on the road to authenticity, and hope and pray that what matters most shines through most clearly. 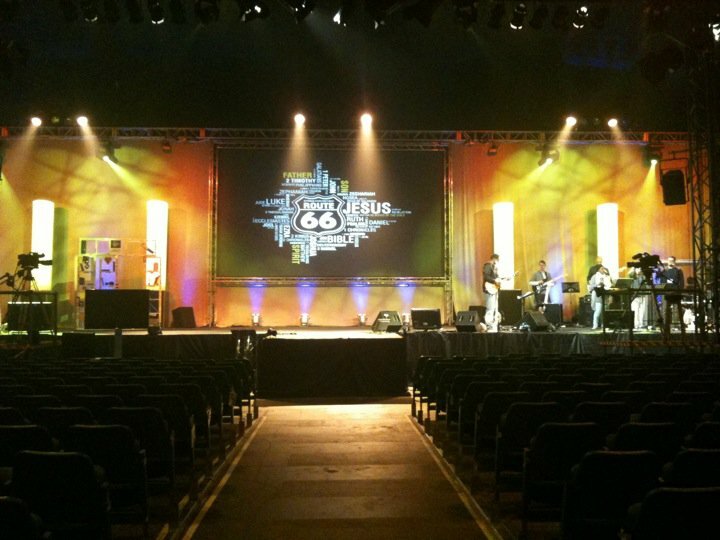 Wow - what a stage! I have recently returned from speaking at Spring Harvest - a huge festival for Christians, with teaching, bands, creative arts, sport, youth and kids work and a load of homicidal seagulls in Minehead. Working with incredible people in such a dynamic environment is just awesome. 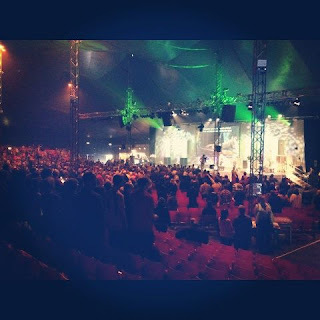 And leading and teaching on the super-size stage of the big top is a unique experience. Talking to one person meaningfully is one skill. Communicating with a small group is another. Capturing the attention of 100 or so is a different kettle of fish. But steering a message or a programme for thousands is like learning to communicate all over again. It is as if the dynamic is slower - like steering a ship instead of a speedboat. The reaction is delayed and it ripples out, which to start with makes you wonder if you are immediately connecting. Your pace has to adjust - but without stalling, or faltering. To add to the learning curve, your face is being blown up on a massive screen, which means that while your instinct is to massively upscale your body language to fill and own the stage, if you are not careful your facial expressions can just come across as manic! I feel like every year, I learn a bit more, and as the nerves gradually decrease due to familiarity, so my desire to excel and develop increases. I loved it all - the conversations, one to one, the small zone I taught in, the creative team I coordinated and the huge crowd I shared time with. Amazing. It was a wonderful time this year - and I feel privileged to be part of the event. 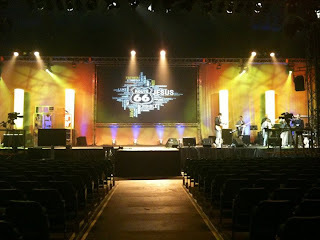 How do you feel about speaking in front of different size groups? Do you have mechanisms for coping with your nerves? It's that time of year again. The time of cards and family newsletters. The time when we carefully communicate about our lives to the people we know. But what do we communicate and why? I will confess, I have been chronologically challenged this year. Having sworn I would be ahead of the card curve, I am in fact going to be the last to send again. And I can't help feeling people will think I have forgotten them, or worse still that I am only sending them a card because I received theirs and thought I should respond. Welcome to my thinking process. I knew Iwas in trouble as last year's Christmas cards and presents lists are still in my in-tray to file away. This did not not bode well. What happened to this year? I fear it dragged me through it. So today I got round to finishing our 2011 newsletter. I love reading newsletters, and hope others find ours as enjoyable as I find theirs. I love seeing their kids growing, their news, how their time and energies are being invested. Each one is changing their corner of the world and I am refreshed by dipping into their lives, even if it is occasionally. Life is a collection of relationships after all. Some close and frequent, others not. But what to write? You do not want to sound like you are the Waltons. You don't want to admit you're more like the Simpsons. It isn't a competition or a chance to impress people, marketing your family somehow, so you don't want to make your kids sound like angels (the readers may well be struggling in their own family), but you want to celebrate your family achievements and special occasions too. You don't want to boast about your tour of the world (I wish) when others may have had no holiday all year, and you don't want to whinge about how challenged your finances are either. The worst part, I think, is that we have a horrible habit of comparing others' highlights to our every-day warts and all lives. It's easy to look like a brochure for the perfect family on paper; thank God it isn't a video diary we send eh?! We must stop ourselves comparing their best bits with our reality. Their reality doesn't look like that every day either. But I do want to reach out to far-flung-friends, to be authentic, to give a flavour of our crazy life, to share our challenges and our joys and to touch base with them. For me, communicating matters. It shows I value them, and I value their communication with me. I value their prayers, interest and the connection we have, even if it is yearly. Or am I just hopelessly sentimental.........????? What do you think? Do you love newsletters or loathe them? Do you write one? Do you read the ones you receive? Branding - is it just a logo? What is a brand anyway? Is it just your logo or how funky your website is? So often when people say to me they are re-branding, what it means is that they are schuushing up their graphics a bit to bring things up to date. Which is fine and good but probably not rebranding in any meaningful way. Think of brands which inspire you. We recognise thousands. Starbucks? Cath Kidston? Virgin? Those words are more than names - they make you think of a certain lifestyle, a certain personality, a certain style. Which is quite an achievement when you think about it. Your brand is everything you are and everything people say about you - inside and outside your organisation. It's how people are spoken to on the phone, it's how easy your site is to navigate, it's how welcome they feel in your building, it's whether your product or service delivers on its promise. A strong brand knows in a really deep way who they are, what is important to communicate, how to create a perception which is authentic to who they are, and who build loyalty and meaning around their brand. They also know who they are communicating to and why. This then informs all the 'touchpoints' of their organsiation - the logo and packaging, answerphone messages and uniform, staff training and even their product and service. So everything shines the values in a clear and exciting way to the right people in the right way. Having a strong brand creates consistency, aligning all the experiences of the company/organisation around the brand, reinforcing and demonstrating the values and beliefs of the brand. So creating a logo is quite a tricky job. But building a brand, a reputation, a position is far trickier and a lot more involved. But ultimately far more satisfying. I'm chatting with a few charities about this at the moment. It's fascinating, and a great clarifying process. Today I spent time communicating with paint. Now either you will get this or you really won't! How can it be possible for a reasonably sane person to spend hours staring at paint charts, allowing the colours to speak? Today Farrow and Ball's Pigeon spoke to me. I actually kept smiling and staring in awe at its beauty. I repainted an old dresser which was dark blue into this GORGEOUS grey/green fabulous shade. I found myself marvelling at the consistency, the pigmentation, and became aware that I had been totally drawn in by the marketing spiel. But it is classy and gorgeous and undeniably it communicates to me and other Farrowites who know their paint pigmentation stuff! We spend alot of time thinking about how our home communicates; we create our home brand if you like. Modern country, city chic. minimalist etc... And so we communicate some truths and values about ourselves, our likes, our way of living. I wonder what your home says about you? I'm Cathy Madavan and I run Mulberry Communications Consultancy - a channel for me to speak, write and help others to communicate fruitfully - whether personally or in their business. I love my family, my home and my faith. Have you considered that you are always communicating? And that you are always being communicated to? I have a passion to see things that matter communicated well. I want to be fruitful - to see people and projects grow as I communicate through words and actions. I want my values to shine through - for my deeds to match what I believe. And I want this to be true in all of my life - in my home, as I work, speak or write and as I serve my community and my church. It's something I hope I can encourage you to grow in too. How can Mulberry help you? Copyright Mulberry Communications Consultancy Ltd.. Simple theme. Theme images by luoman. Powered by Blogger.